Force India unveiled their new 2017 challenger at Silverstone yesterday. 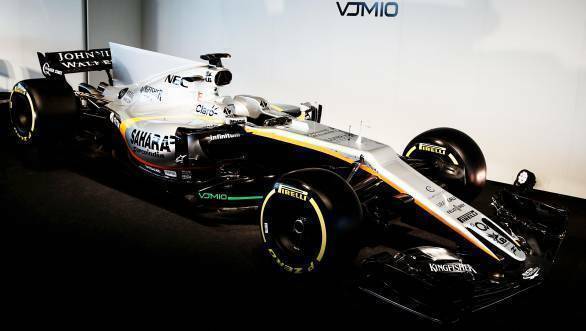 The VJM10 is the first machine that Sahara Force India has built entirely on their own. The car, powered by Mercedes, features the team's characteristic silver, black and orange livery. There are changes of course - keeping with the 2017 season regulation changes, the new Force India features a shark fin engine cover and the thumb-stub nose that we've seen on other cars for the 2017 season. Unveiling the car at Silverstone were Esteban Ocon and Sergio Perez, the team's two drivers for the 2017 season. While Perez is an old hand, Ocon is a rookie, a part of the Mercedes Junior team. Speaking at the launch team principal Vijay Mallya said that repeating the team's 2016 performance - they finished fourth overall in the constructor's championship - would be a task in itself.